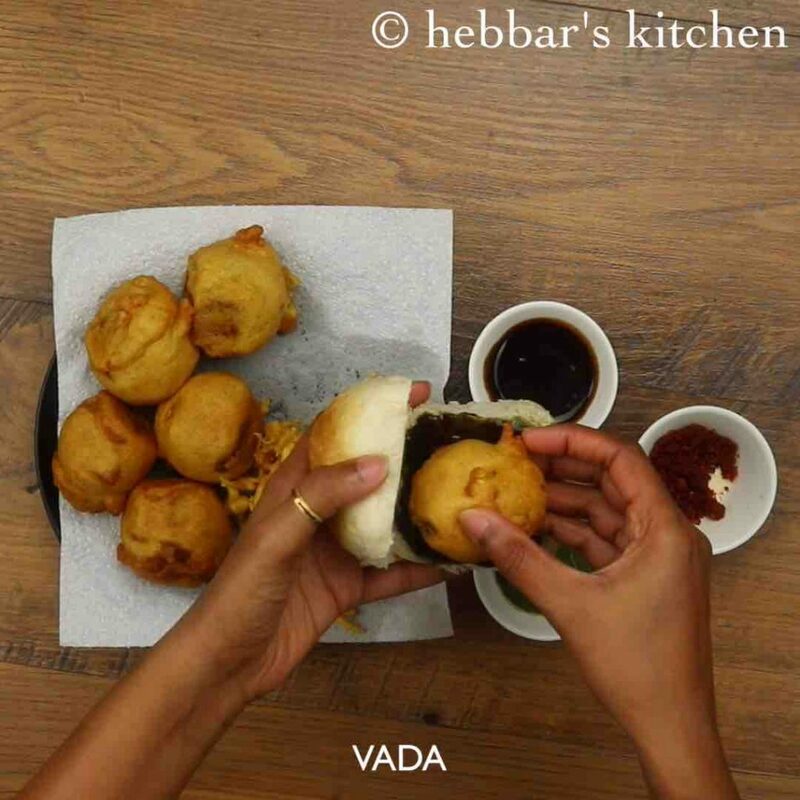 vada pav recipe | how to make vada pav | wada pav with detailed photo and video recipe. 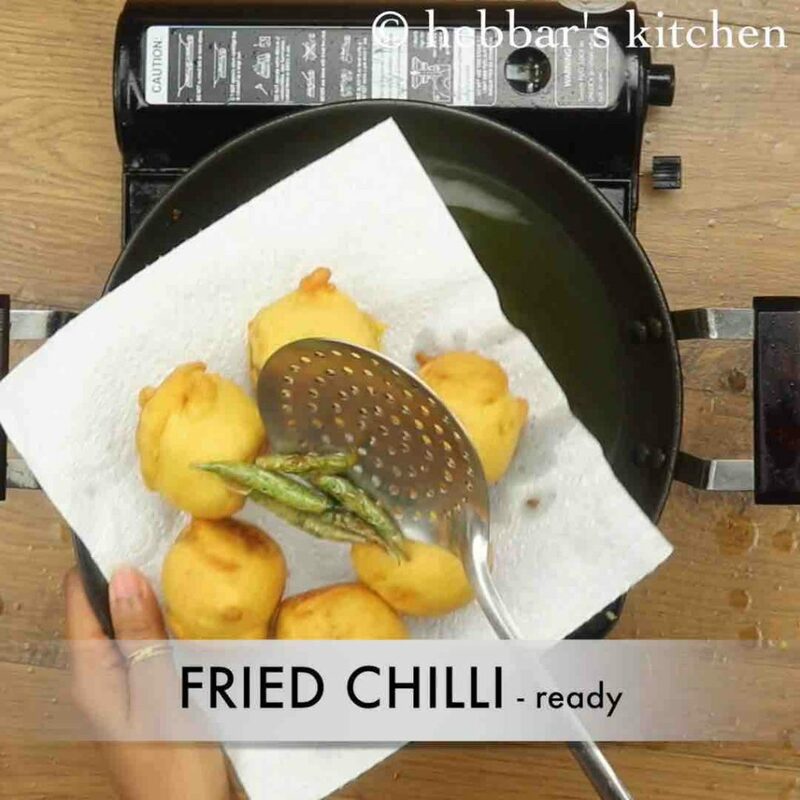 a popular indian street food recipe prepared mainly with pav bread and deep fried batata vada stuffing. most commonly, this snack is also referred as indian burger or aka bombay burger because it hails from maharashtra or marathi cuisine. generally, it is served as an evening snack, but can also be adapted to breakfast. 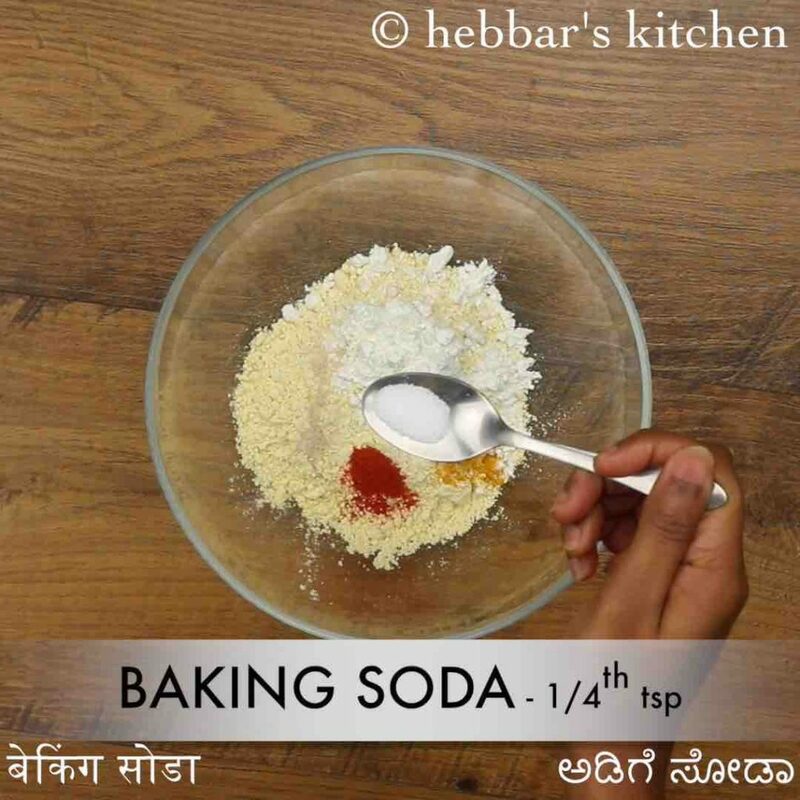 vada pav recipe | how to make vada pav | wada pav with step by step photo and video recipe. mumbai or previously referred as bombay is known for its fast life which basically can be seen its mumbai or marathi cuisine. most of the street or any popular tourist attraction places are filled with street vendors with myriad fast food dishes. 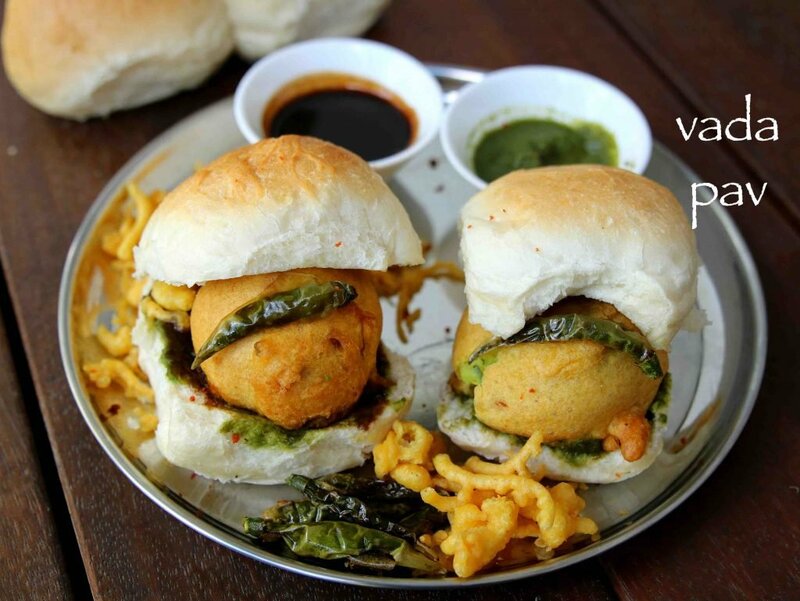 vada pav is one such easy and tasty fast food dish, filled with carbohydrates and fibre. 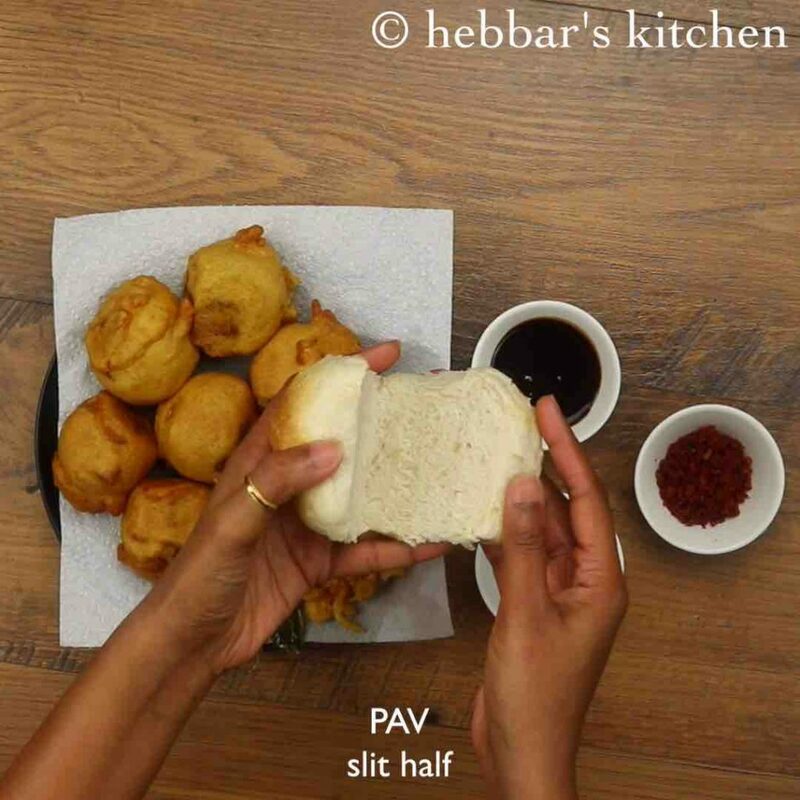 unlike the traditional burger recipe, vada pav recipe is much easier and quicker to prepare and assemble it. 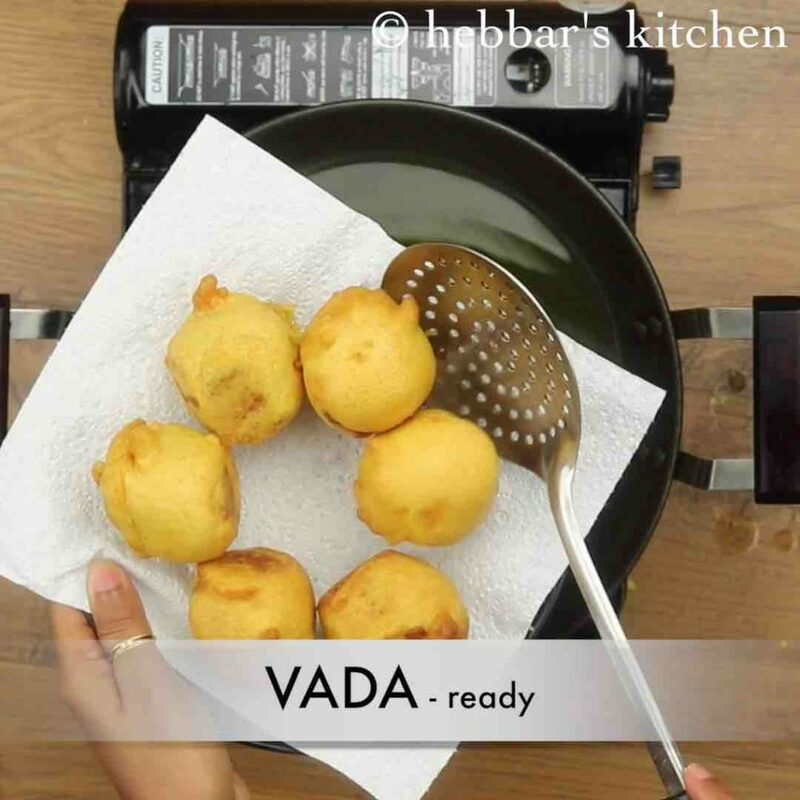 the critical part of any good wada pav recipe lies in its crispy and savoury vada or batata vada. these patties are slightly different from the conventional aloo bonda or vegetable bonda. basically, the batata vada stuffing is mainly made from potatoes without onion or peas combination. 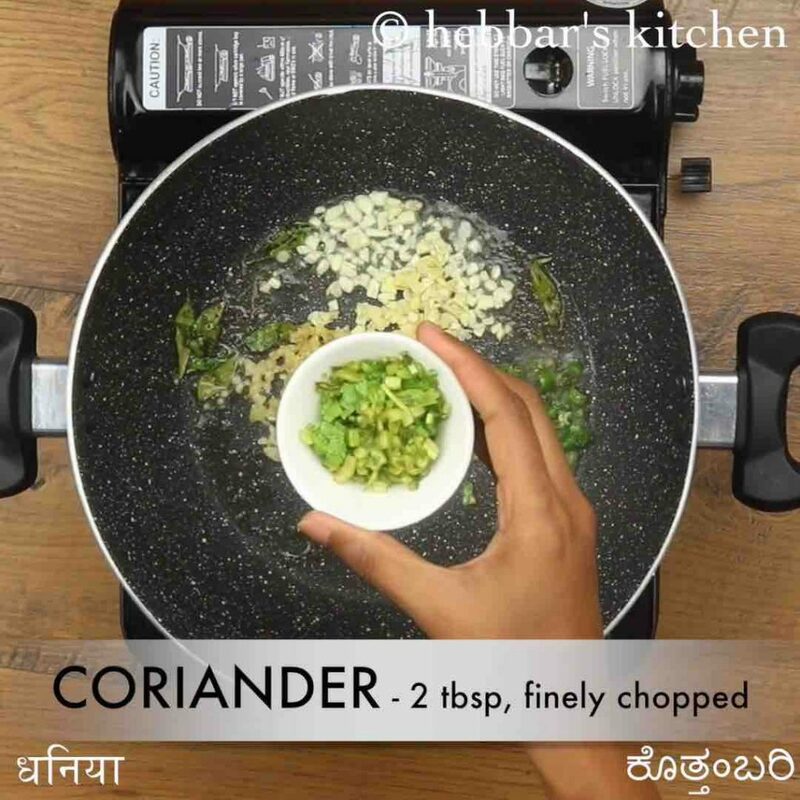 also, it contains a strong flavour of garlic, ginger and coriander leaves. moreover, the patties are typically oval shaped as compared to round bonda’s. having said that, it is not mandatory and can be shaped to round and then later pressed while assembling it. 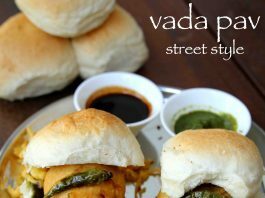 the vada pav recipe is extremely simple to prepare, yet i would like to add few tips and recommendations while preparing. firstly, ensure the boiled and mashed potatoes are moisture free and removed immediately from pressure cooker after it is cooked. 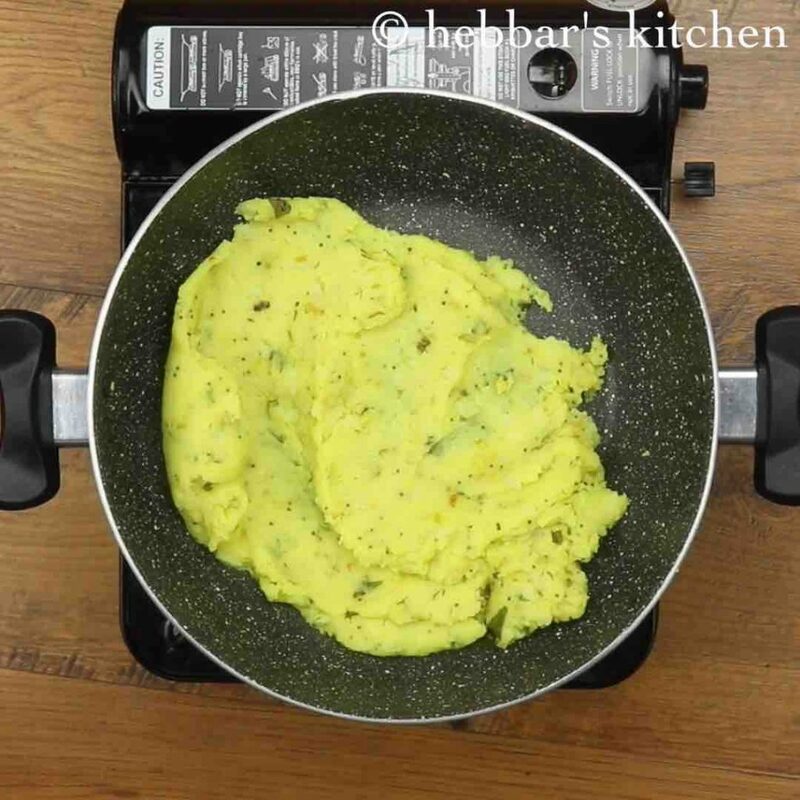 if you feel you mashed potatoes contain moisture, fry them in a pan for 2-3 minutes to remove it. secondly, i have added baking soda to the besan batter to make vadas crisper. also, add 1 tbsp of rice flour/cornflour to make it even crisper. 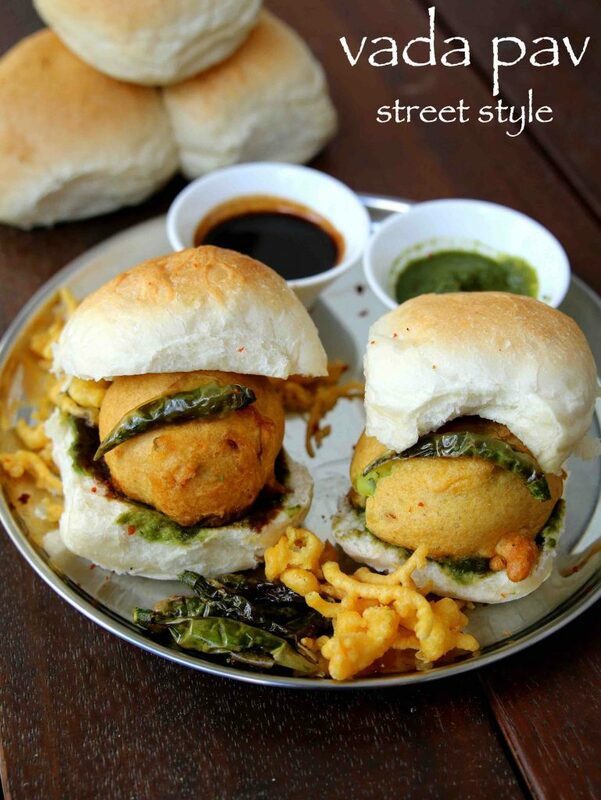 lastly, these vada pav should be served immediately after deep frying and assembling. 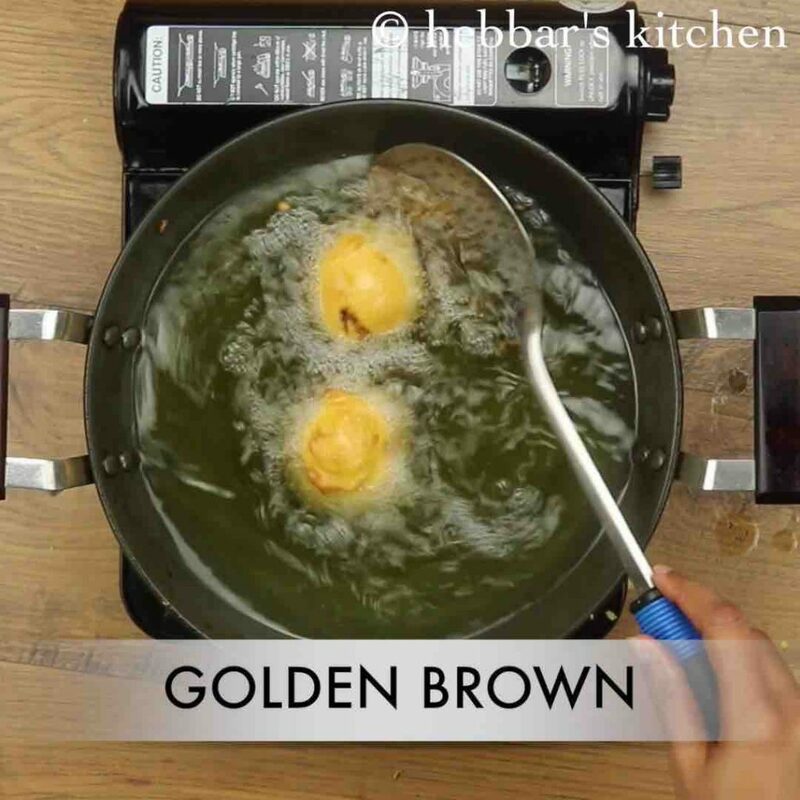 alternatively, you can place the deep fried vadas in a preheated oven or even deep fry again for 1 minute if serving later. 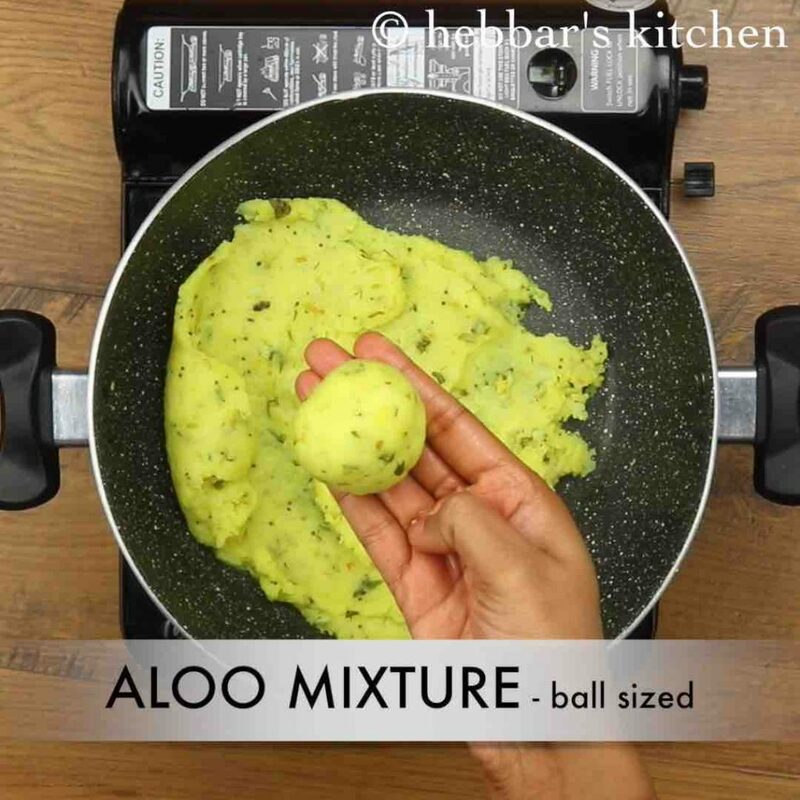 firstly, take ball sized aloo mixture and dip in besan batter and coat well. deep fry in hot oil stirring occasionally. now slit the ladi pav and spread 1 tsp green chutney, ½ tsp tamarind chutney and ½ tsp dry garlic chutney. place the prepared vada in center of pav, chura and fried chilli. finally, press the vada pav and serve immediately. 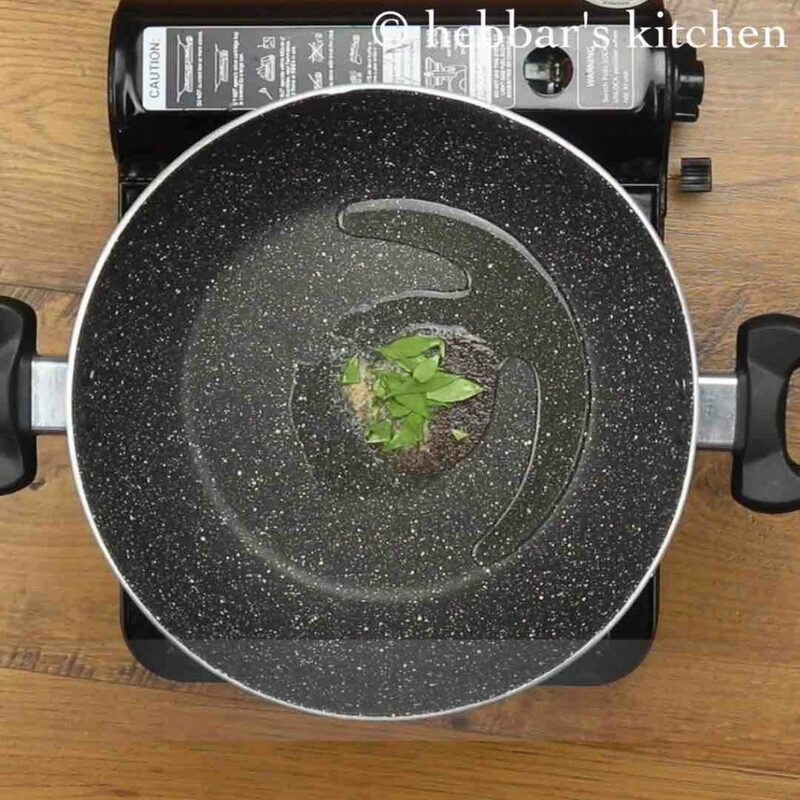 firstly, in a large kadai heat 2 tsp oil and splutter ½ tsp mustard, a pinch of hing and few curry leaves. also add 1-inch ginger, 2 clove garlic, 1 chilli, 2 tbsp coriander and saute well. 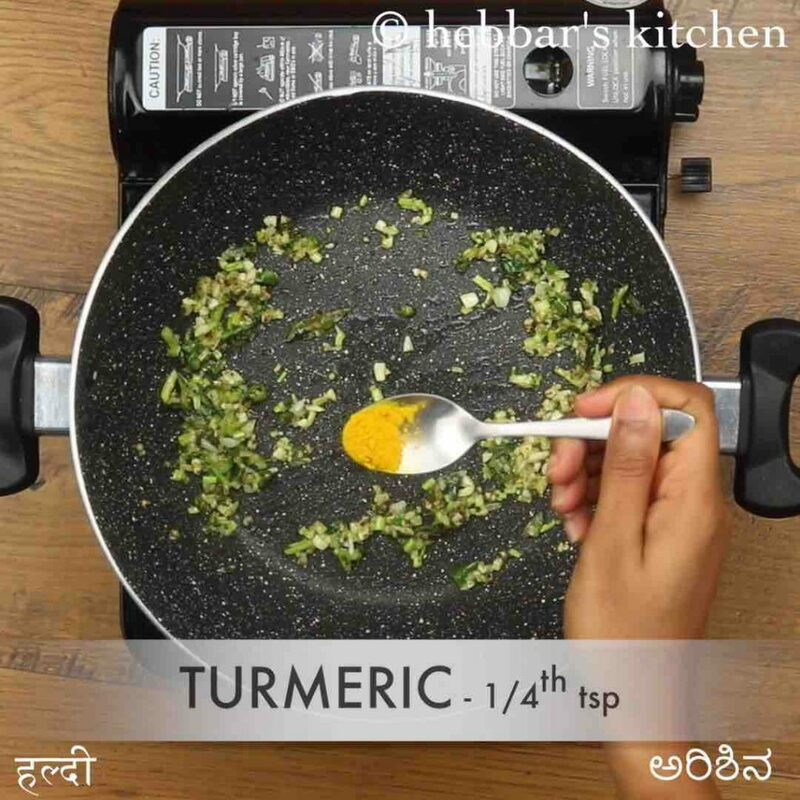 further, add ¼ tsp turmeric and saute for 30 seconds. additionally, add 2 boiled and mashed potato and ½ tsp salt. mix well making sure all the spices are combined well with potato. 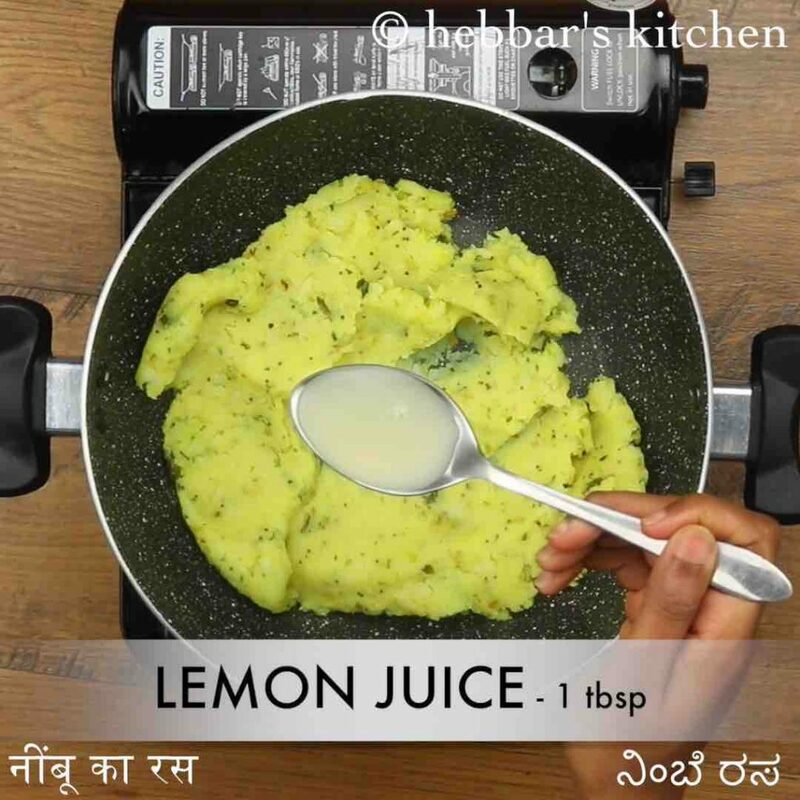 turn off the flame and add 1 tbsp lemon juice. 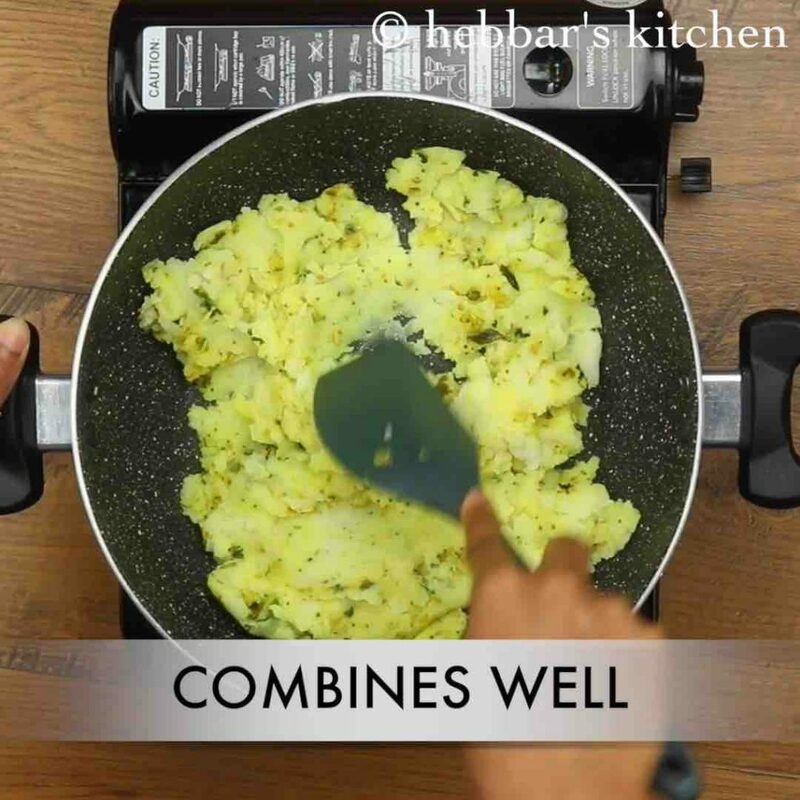 mix well and aloo mixture is ready. keep aside. 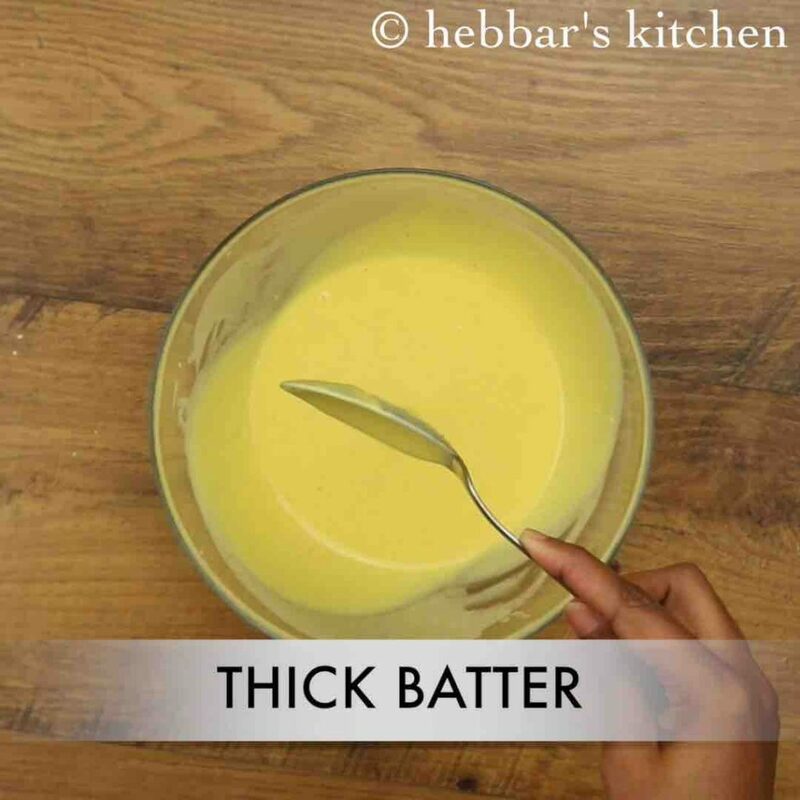 further, prepare besan batter by taking ¾ cup besan, 1 tbsp rice flour, ¼ tsp turmeric, ¼ tsp chilli powder, a pinch of hing, ¼ tsp salt and ¼ tsp baking soda. add ½ cup water or as required and prepare smooth lump free batter. 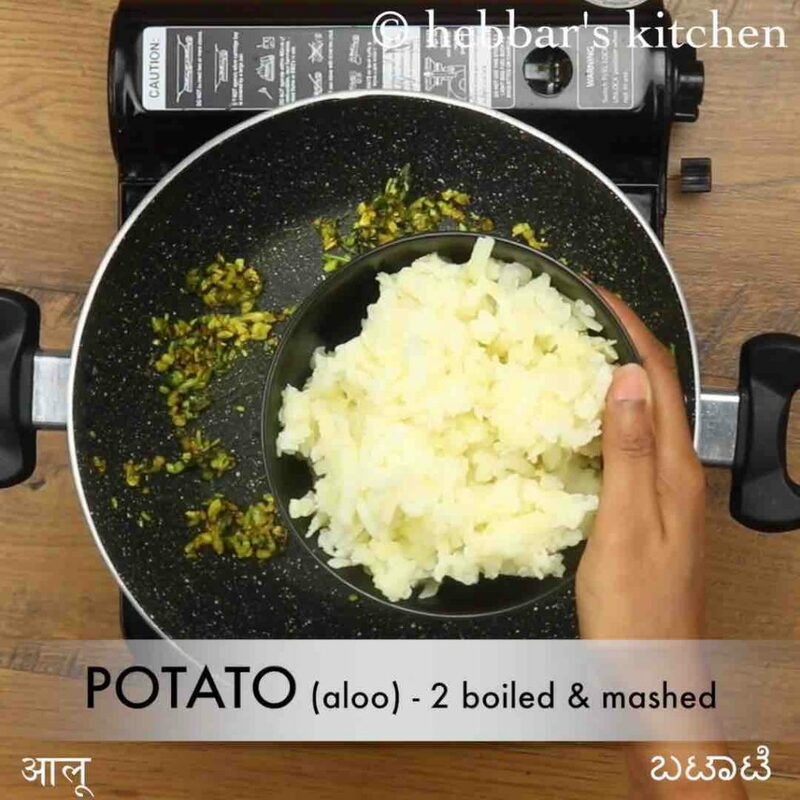 now make ball sized aloo mixture. i like my vada to be round rather than flat, flatten the balls slightly if you prefer. 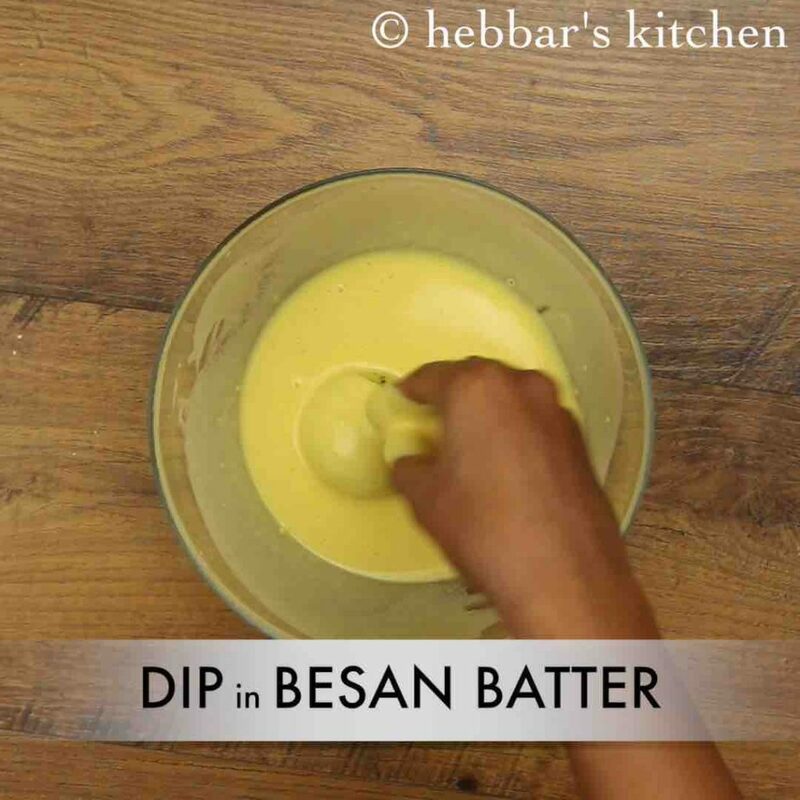 dip in prepared besan batter and coat well. fry on medium flame till the vada turns golden and crisp. drain the vada on a kitchen paper to absorb excess oil. keep aside. 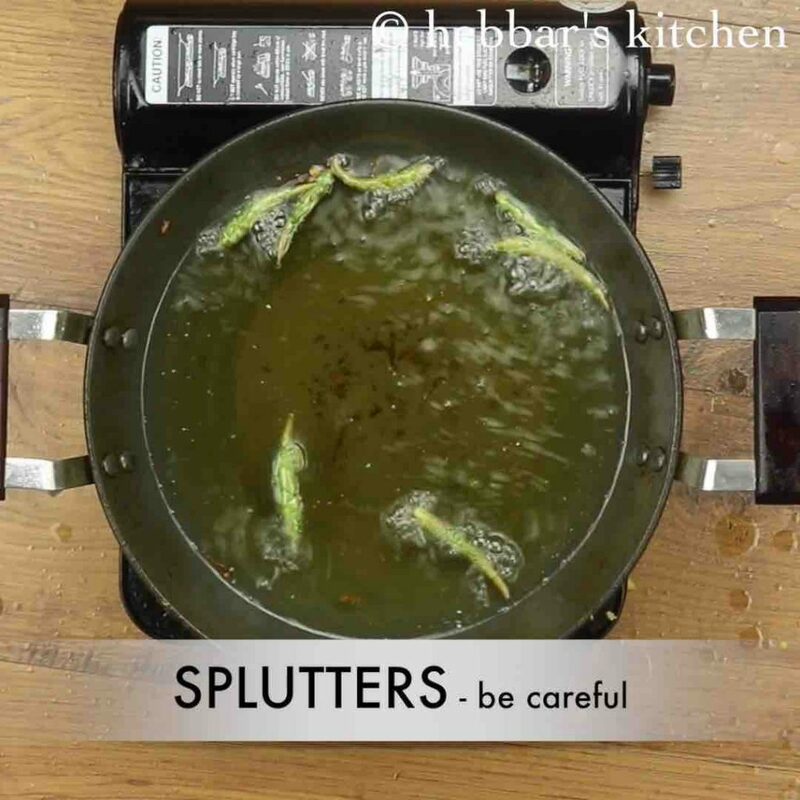 now fry the green chilli, by turning off the flame – be careful as the oil splutter. stir occasionally, till the blisters appear on chilli. 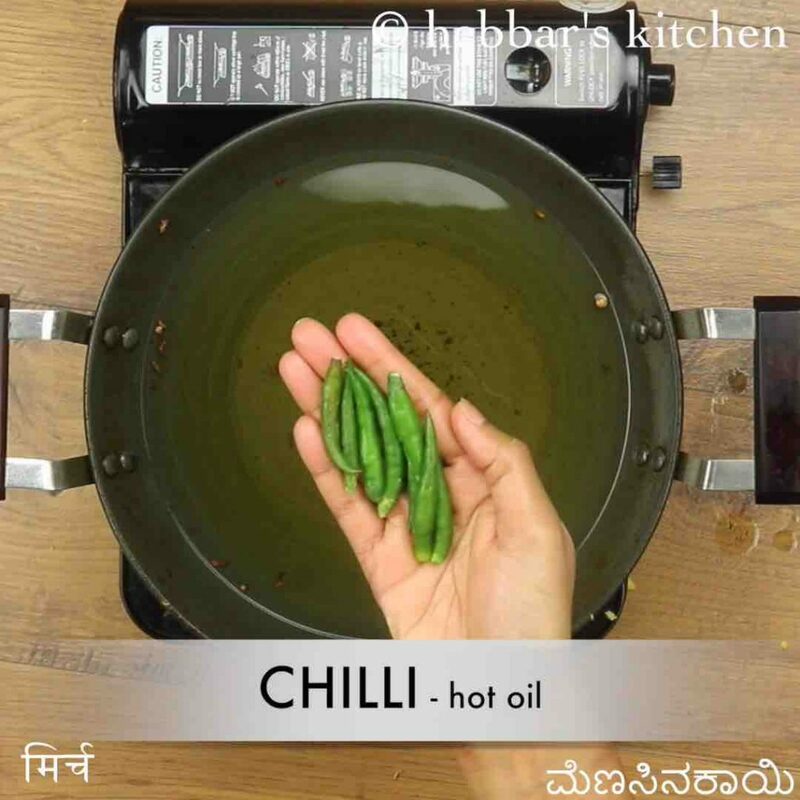 drain the fried chilli on a kitchen paper to absorb excess oil. keep aside. 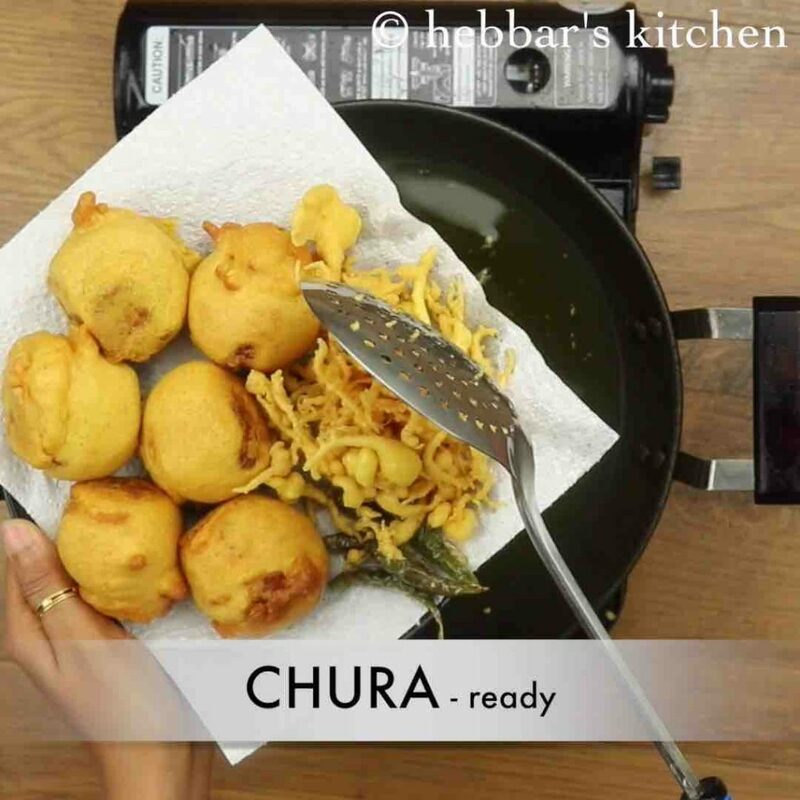 now with leftover besan batter prepare chura by pouring watery besan batter in hot oil. 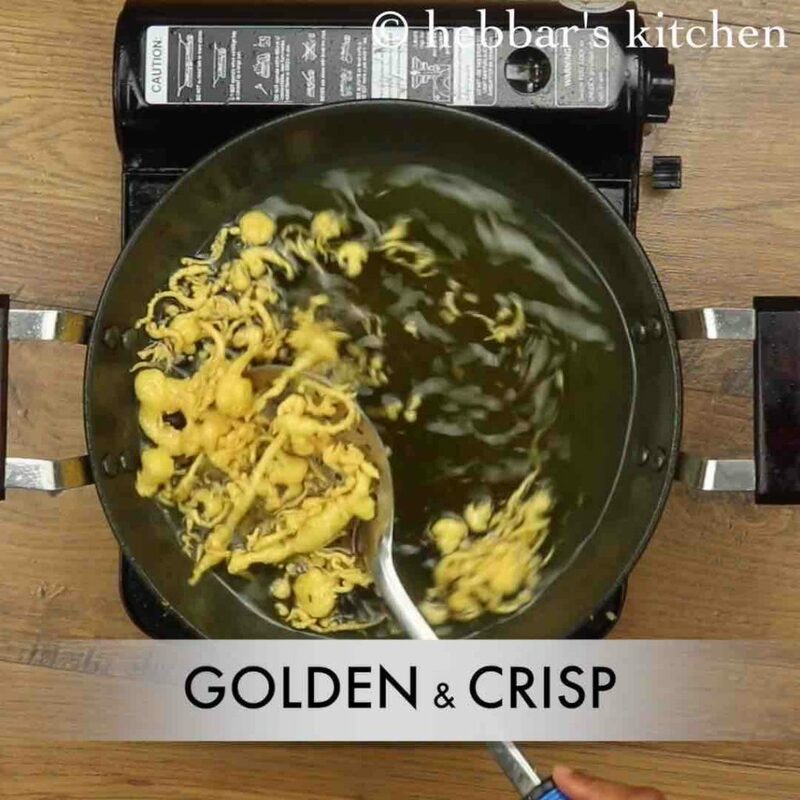 add 2 tbsp of water to besan batter to make watery besan batter. fry on medium flame till the chura turns golden and crisp. 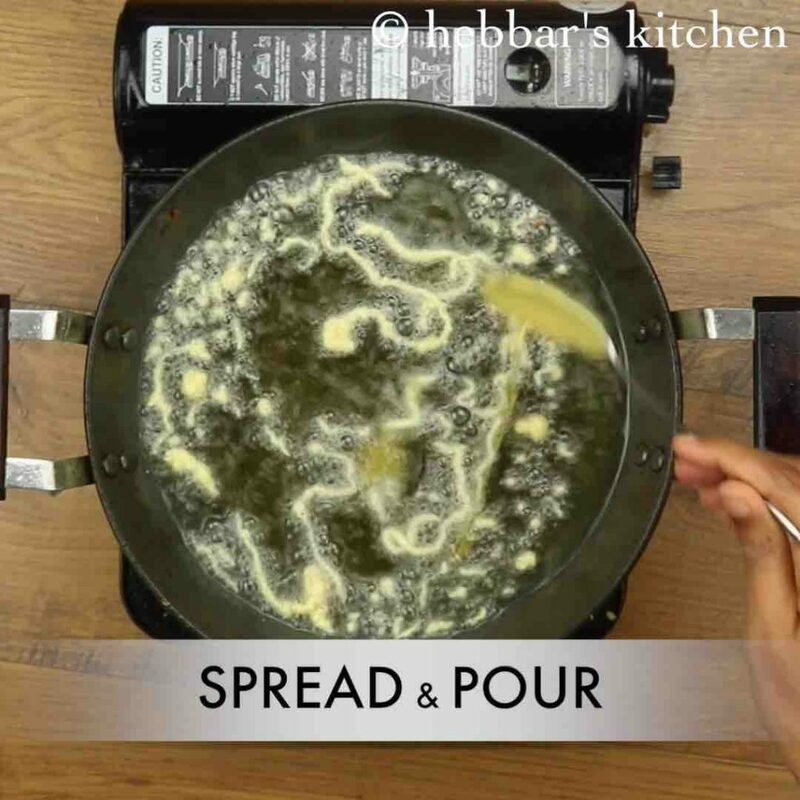 drain the chura on a kitchen paper to absorb excess oil. keep aside. now slit the ladi pav centre halfway without cutting fully. 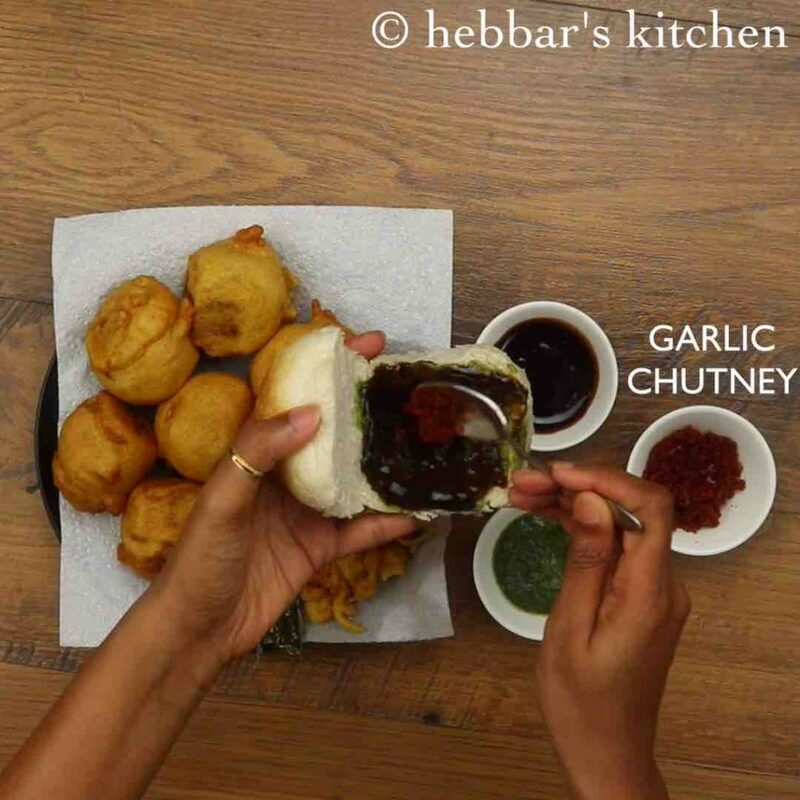 spread 1 tsp green chutney, ½ tsp tamarind chutney and ½ tsp dry garlic chutney on one side of inside pav. place the prepared vada in center of pav. also stuff few prepared chura and place a fried chilli on top of vada. firstly, adjust the amount of green chutney, tamarind chutney and dry garlic chutney to your choice. 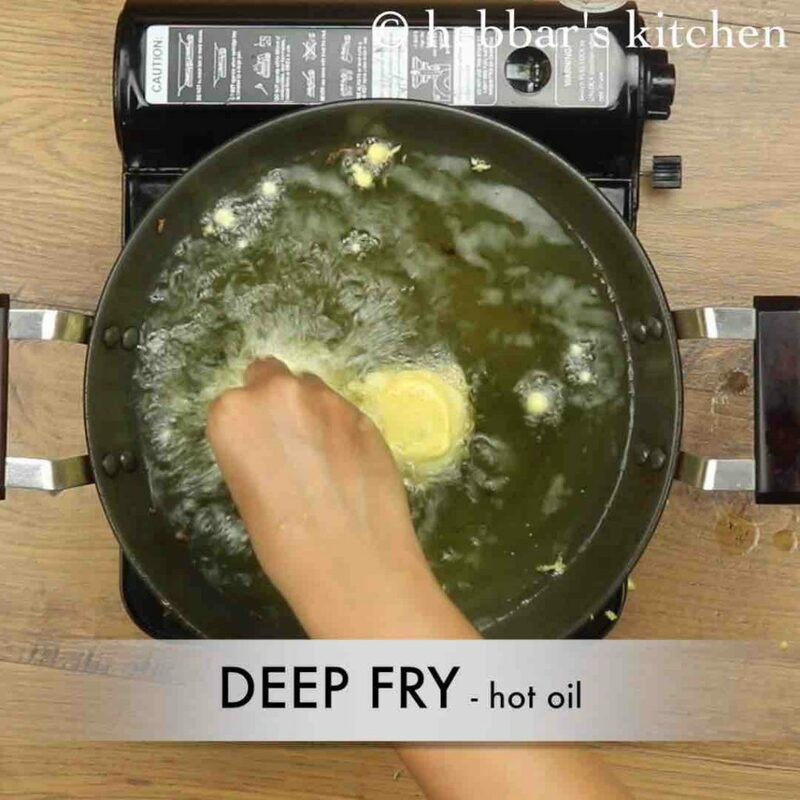 in addition, to keep the vada flat, make sure to shape before deep frying. furthermore, add rice flour / corn flour to besan batter to get crispy vada. 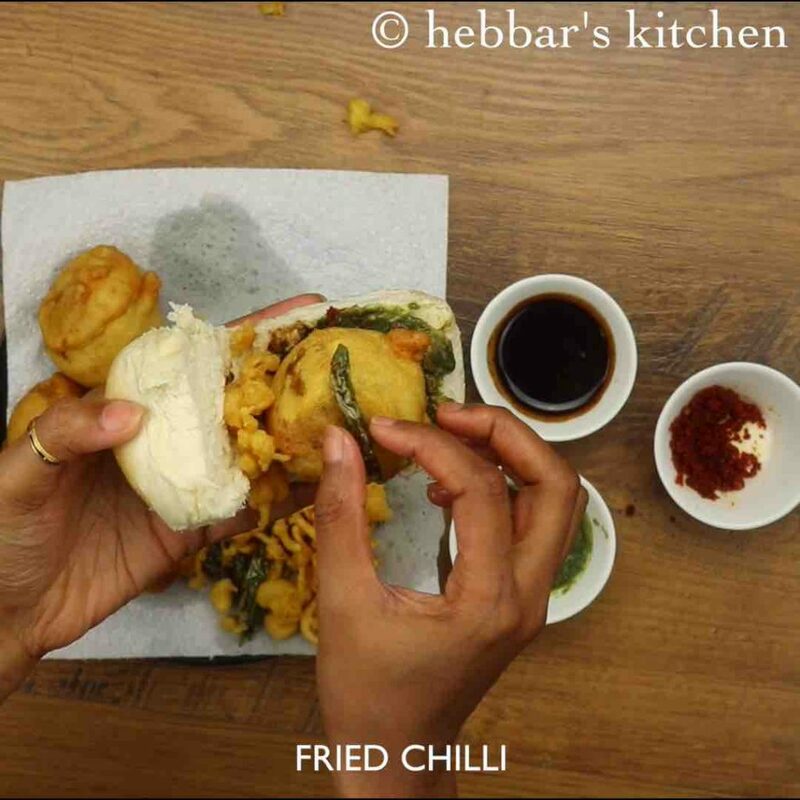 finally, vada pav tastes great when served hot with fried green chilli.